There is nothing like being awakened by a ringing phone and finding a pair of yellow euyes staring back at you. I think Julius knew I'd never had pet and he'd taken it on as his duty to train me in the art of cat cohabitation, which included sitting on my chest when he wanted breakfast. His yellow eyes blinked at me as if to say, "would you get up and get me some food. Preferably that stuff in the can with the fabulous fishy odor. The fluffy black cat let out a complaining meow as I tried to move him out of the way so I could reach for the cordless, which continued to ring insistently. He held on tight and jumped off only at the last minute with another meow as I clicked on the phone. "What was that noise?" my mother said, skipping right past a hello or good morning. "It sounded like a cat. Casey, don't tell me you got a cat. Not with your history." This was exactly why I hadn't told her about Julius. Besides, I really didn't get Julius. He showed up at my door, invited himself in and stayed. I could only guess at his backstory. I'd taken him to the vet, who gave him his shots and told me he was somewhere between one and five years old. Since he'd already been neutered it appeared he had belonged to somebody and then was most likely abandoned. Along with the other cat supplies, I'd gotten him a collar with his name on it and had him chipped. The history my mother was referring to was the fact that I had trouble sticking with things. How could I explain to her that the at was different. I might have trouble sticking with professions, but Julius and I were going to be together for his forever, no matter what. But I needn't have worried about an explanation, because she didn't leave space for one. She just launched into her call. "I didn't wake you, did I?" my mother said, before offering some excuse about the time difference. C'mon. My mother is a cardiologist who fixes broken hearts. Did she really expect me to believe she couldn't calculate tat 9:00 a.m. in Chicago translated to 7:00 a.m. here in Cadbury by the Sea, California? Nor did I believe that she didn't remember that I worked nights baking desserts for the Blue Door restaurant and muffins for the coffee spots in town. I sat up, reluctantly pulling back the snuggly lightweight down comforter I'd been cocooned in as my mother continued on with small talk. She always began our calls that way, as if I didn't know why she was calling. My fee touched the cold wood floor and felt their way into the rose-colored plush slippers next to the bed. The light coming in the room was flat and I could see a snippet of white sky. It didn't matter that it was May, the weather was the same as it had been in November. Cool, cloudy and damp. Once I was well versed in what was going on with my pediatrician father, she moved on to the real point of the call. If my mother hadn't been a doctor she could have been an interrogator for the cops. "So, have you had enough yet? Are you ready to leave?" she said. I bristled silently at her questions. But I couldn't argue. I had a certain reputation and I can't say it wasn't well earned. I'd gone through numerous professions -- a semester of law school before dropping out, two years of substitute teaching at a private school before I faced the truth that it wasn't for me. Even my gig as a baker had lasted only six months, until the bistro closed. But at least I'd loved it, and in a way it had led me to a future. The rest of the time I'd done temp work-- everything from handing out samples of breath mints to spritzing shoppers with perfume. The only temp job I'd really liked was working at the detective agency, but that had ended, too. Hoping a fresh start would make a difference I'd relocated to my aunt's converted garage/guesthouse in Cadbury by the Sea. With her help I'd gotten a job baking desserts at the Blue Door along with the muffin-baking business. Thinking about my aunt Joan made my eyes get misty. Just a few months after I'd moved in, she was killed in a hit-and-run. I'd inherited her house and her business. "Mother, it's different this time," I said. I could practically see her response. She was no doubt dressed in one of her many pantsuits and I'd heard one of her dangle earrings knock against the phone. I would bet her eyes had gone skyward as she'd shaken her head in disbelief. I might have shared a little of her disbelief. It wasn't as if I had any experience in the business my aunt had left me. It was called Yarn2Go and involved putting on yarn retreats. The next question was always, what are yarn retreats? The retreat part is easy to understand. It means a group of people withdrawing for prayer, meditation, study or instruction under a director. I guess the director means me. There isn't any prayer or study involved, but since yarn work seems to be meditative you could keep the meditation in. and there is some kind of instruction. That's where the yarn part comes in. So far it has been only knitting. Another reason for my mother's disbelief was my basic lack of yarn skills, or so she thought. When I put on the first retreat I hadn't even known how to knit. I have to admit it wasn't exactly love at first clack of the needles, but something happened during the weekend and by the end I'd begun to understand why people loved working with yarn. You could say I caught the bug. In the time since that retreat, I had upped my skills, though I still had a long way to go before I was close to my aunt's level. At least now I know how to cast on, knit, purl and cast off. I hadn't discussed it with my mother, knowing there was no way she would understand. I girded myself as I got ready to tell her about the retreat I had coming up the following weekend. "I'm doing an event Aunt Joan always wanted to do. It's a little bigger than the first one I put on with only five retreaters. Well, six if you count the one who died." "If I were you I'd never mention that anyone died, again. Who would want to go on a retreat if they knew last time that someone didn't make it to the end? So what's the big number of retreaters for this one? Seven?" It was as close as my mother ever got to a joke. "More like twenty," I said. "This retreat is totally different from the last. Joan called it Sheep to Shawl. We're going to start off with some sheep getting sheared -- humanely of course-- then go through the steps of turning the wool into yarn. Finally everyone will knit a shawlette out of the finished yarn." 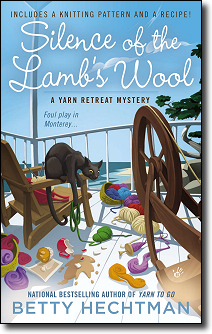 Before my mother could say anything, I added that I'd found somebody in town who knew about the process of turning wool into yarn and was handling that particular aspect. My mother didn't really want to hear all the details, and cut in "I'm just checking. The cooking school called to let me know the new session is starting up next month. It's all set up for you. You could be spending the summer in Paris. And at the end, you'd be a professional chef." I'd gotten the same call the previous month. When I'd first taken over my aunt's business, my parents, well mostly my mother, had stepped in, sure that I was just going off on another temporary job tangent, and offered to send me to cooking school in France, which she regarded as a way to turn my interest in baking into a real profession. I gave her the same answer I'd given her the month before. "Not yet." I want to say "not ever," but one thing I'd learned about myself was ever say never.